World-premiere performances of songs and two short films for Portland Jazz Composers Ensemble with vocalist Marilyn Keller, and workshops across the state. (PORTLAND, OR)—Supported by the Oregon Community Foundation’s Creative Heights program, the Portland Jazz Composers Ensemble’s (PJCE’s) concert of original songs and film shorts inspired by the stories of the multicultural populations of Maxville and Vanport, Oregon debuts April 12–14, 2018 in La Grande, Enterprise, and Baker City, Oregon and May 26, 2018 at Portland, Oregon’s Vanport Mosaic Festival. This collection of songs and short films produced by composer Ezra Weiss with writer and speaker S. Renee Mitchell providing lyrics and vocalist Marilyn Keller performing with the PJCE accompanied by shorts by filmmaker Kalimah Abioto celebrates the shared history of African-American Oregonians, focusing on two towns that represent distinctive viewpoints of the state’s under-discussed Black history. Tickets to PCJE’s concerts are on sale now and are available online through pjce.org. It isn’t widely known, but among the homesteaders, loggers, ranchers, and other hardy folks who were Oregon’s early settlers, African-Americans played vital roles. Songs like “Oregon Sounds Like Freedom” weigh the relative freedom of living Oregon against the hardship of staying in the Jim Crow South. 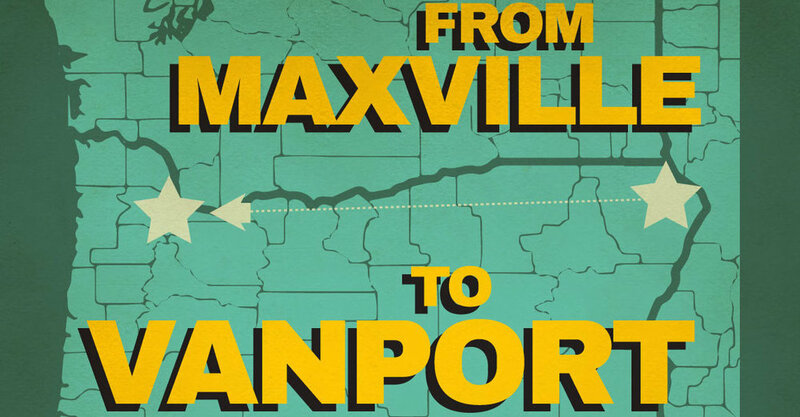 MAXVILLE TO VANPORT may leave listeners wondering if the dangerous work falling logs in the woods of Wallowa County was worth the pain of leaving one’s birth community. The project invites the audience to ponder these questions through joyful music composed by Portland jazz composer and pianist Ezra Weiss. Writer, speaker, and self-styled creative revolutionist S. Renee Mitchell has written lyrics featuring legendary jazz vocalist Marilyn Keller. The songs will be interspersed with two short films by Kalimah Abioto focused on the work that women did in Maxville, and a young boy playing in an imagined Vanport who encounters rushing waters that foreshadow the flood that destroyed the city in 1948. PJCE Executive Director Douglas Detrick serves as artistic director for the project which employs a five-member creative team aiming to speak with the communities that are connected to these stories, not for them. The team drew heavily on records and research of Gwendolyn Trice, Executive Director of Maxville Heritage Interpretive Center, whose father worked at Maxville. $20 general, $15 senior & veteran, $10 students | Tickets available online. $50 includes concert and dinner | Tickets available online or by calling 541-523-5369. $35 preferred GA, $25 general, $20 senior & veteran, $5 Arts For All tickets available at the door day of show only. | Tickets available online or by calling 503-764-4131. The year-long project that began with community discussion events in Portland and Joseph in the fall culminates in a performance tour to La Grande, Enterprise, and Baker City, as well as a studio album, a short documentary film and a performance in Portland in conjunction with the Vanport Mosaic. The project was generously funded by the Oregon Community Foundation’s Creative Heights program and was sponsored by the Oregon Historical Society. Project partners include Vanport Mosaic, Josephy Center for the Arts, Crossroads Carnegie Center for the Arts, Eastern Oregon University, and the OK Theatre. The Portland Jazz Composers’ Ensemble is a 12-piece jazz ensemble which commissions and performs original works by its members and by other jazz composers in the Portland music community and beyond. It is our mission to operate a large musical ensemble, to commission and perform original works by members of the ensemble and by other jazz composers in the Portland music community and elsewhere, to act as a forum for the development and presentation of works for large ensemble by established and emerging jazz composers, and to engage and enrich community awareness and appreciation of contemporary music. Portland Jazz Composers Ensemble at Montavilla Jazz Festival. Enrich the first uniquely American art form. Cultivate the development of new music. Encourage and promote established and emerging living composers. Provide a forum for experimentation without commercial concern. Disseminate contemporary American music through publicity, recordings, newsletters and affordable concerts in varied venues to promote jazz appreciation both locally and nationally. Collaborate with artists, other nonprofits, and creative organizations in multiple disciplines. Foster relationships with educational institutions.